President Bush speaks of Reagan's legacy. CNN's Bruce Morton on the multifacted life of Ronald Reagan. CNN's Wolf Blitzer reports on the Reagan presidency. What will Ronald Reagan be most remembered for? 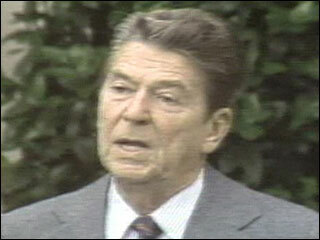 LOS ANGELES, California (CNN) -- Former President Ronald Reagan died Saturday at his home in Los Angeles. He was 93. Reagan led a conservative revolution that set the economic and cultural tone of the 1980s, hastened the end of the Cold War and revitalized the Republican Party. He suffered from Alzheimer's disease since at least late 1994. His wife, Nancy Davis Reagan, and their two children, Ronald Jr. and Patty Davis, were with him when he died at his home in the Bel Air district of Los Angeles. Michael Reagan, his adopted son from his first marriage to actress Jane Wyman, arrived at the home shortly before news of the death. Maureen Reagan, his daughter from that marriage, died of brain cancer in 2001. Bush's father, former President George H.W. Bush, said "history will give Reagan great credit for standing for principles." "It was wonderful the way that he could take a stand, and do it without bitterness or without creating enmity with other people," said the elder Bush, who was Reagan's vice president. Nancy Reagan issued a brief statement to announce her husband's death. "We appreciate everyone's prayers over the years," she said. Michael Reagan released a statement soon after his father's death. "I pray that as America reflects on the passing of my dad, they will remember a man of integrity, conviction and good humor that changed America and the world for the better," Michael Reagan said. "He would modestly say the credit goes to others, but I believe the credit is his." "Hillary and I will always remember President Ronald Reagan for the way he personified the indomitable optimism of the American people, and for keeping America at the forefront of the fight for freedom for people everywhere," their statement said. Presidential historian Robert Dallek spoke of Reagan's contributions to the office. "He restored a kind of confidence in the presidency, and a better mood in the United States about politics and politicians and about the presidency," Dallek said. At a fund-raiser last month, Nancy Reagan described her husband's condition. "Ronnie's long journey has finally taken him to a distant place where I can no longer reach him," she said. "Because of this I'm determined to do whatever I can to save other families from this pain." Alzheimer's is a progressive, irreversible, incurable neurological disorder that causes losses of memory and mental abilities -- eventually leading to dementia, according to the Mayo Clinic Web site. She also called for increased funding for stem-cell research, which has shown promise as a potential treatment for Alzheimer's and other conditions, such as Parkinson's disease. "Now science has presented us with a hope called stem cell research, which may provide our scientists with many answers that have for so long been beyond our grasp," Reagan told an audience in Los Angeles. "I just don't see how we can turn our backs on this." Human stem-cell research is controversial, because it uses cells harvested from newly fertilized embryos. Bush signed an executive order in 2001, banning the use of federal funds to harvest new lines of stem cells for medical research. Reagan disclosed in November 1994 in a passionate letter to the American people that he has Alzheimer's disease. Reagan faded from public view a short time later and has been rarely seen outside his home. The former Hollywood film actor stopped going to his Century City office in 1999 but still made trips to parks and enjoyed strolls on the Venice Beach boardwalk with his Secret Service contingent. At 69, Reagan was the oldest man elected president when he was chosen on November 4, 1980, over incumbent Democrat Jimmy Carter. On March 30, 1981, Reagan was leaving a Washington hotel after addressing labor leaders when John Hinckley fired six gunshots at him. A bullet lodged an inch from Reagan's heart, but he recovered fully. In 1984, he defeated Democrat Walter Mondale. Reagan has also undergone a 1985 colon cancer operation and 1987 prostate and skin-cancer surgery. He fell and broke his hip in 2001, less than a month before his 90th birthday. Former President Ronald Reagan died Saturday at his home in Los Angeles. He was 93.